Jacketed, Bain Marie Still Boilers. This 45 gallon still is great for Bourbon, Whiskey, Brandy, Grappa, Rum, Vodka and many others. 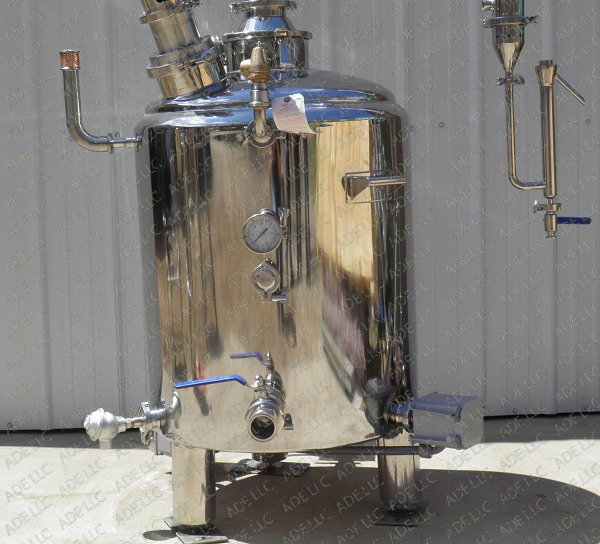 It will distill between 120 and 170 proof with the 4 plate bubble plate column and up to 190 proof with the 4"x6' Vodka Column Extension added. This Still has a beautiful 4" Diameter Copper Bubble Plate Column with four 4" diameter sight glasses, Gatling Gun (Tube & Shell) Dephlagmator on top of the Column and a 3" Gatling Gun (Tube & Shell) Condenser on the right side of the column. The column can be ran in Pot Still Mode to make Whiskey and Moonshine or it can be ran in reflux mode to make high proof light Whiskey or Rum. The optional Vodka Column Extension Can be added to make Vodka The boiler has three 2" Tri Clamp ports, with Tri Clamps and Cover Plates. The ports can be used to install an electric element with controller (please see the heating system option listed below). The Best thing about this 45 gallon still is that it is jacketed. Cooking oil or water can be ran in the jacket. This gives you the ability to run grain in mashes and other mashes such as potato mashes, grappa mashes and fruit mashes with the solids left in, without the worry of scorching. This makes this still perfect for craft recipe research and development. If you are running a production sized still with a pot still head/column or a plated column, we can build you a still that will give you flavor profile and proof results that should closely match your larger still. We have options below for agitators and heating systems etc. We also have these 45 gallon units in a combination Mash Tun Still Configuration. These combination units can be used to both cook the mash and to distill the mash. These units have the agitator center set on top and the column set towards the side. There is no extra cost for the combination Mash Tun Still configuration. The column actually produces a little better in this configuration. The column is completely modular with Sanitary Tri Clamp Connections throughout. It is very simple easy and fast to disassemble the column for cleaning. Plates can be added or removed from the column to run different proofs. The column can be set up to run as a Pot Still Head in a matter of 5 to 10 minutes. Commercial grade thermometer in the oil Jacket. 1"x1.5" triclamp port for a temperature probe in the oil. Base Price for still boiler including drain valve hardware and safety devices $2,092.50. Base price for still boiler including drain valve hardware and safety devices plus the 4 plate bubble plate column: $3,836.25. Base price for still boiler including drain valve hardware and safety devices plus the 4" copper whiskey column (not shown): $2,786.63. 4"x4' Vodka column extension $780.75 with copper packing. Variable speed WEG VFD drive for 1/2 hp agitator to be mounted on the wall NEMA1 enclosure. This VFDs enclosure is not rated for hazardous environments so it should go into a NEMA4x enclosure $389.25. This VFD can be wired 3 phase or single phase input, to supply power to the 3 phase agitator.